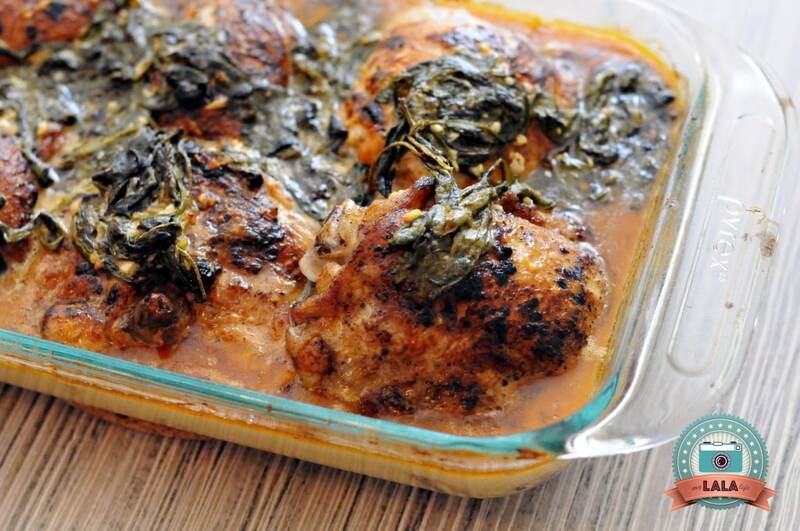 The Creamy Lemon Butter Chicken from Lala’s Kitchen is one of those Thermomix recipes that you will want to add to your regular meal plan. This recipe is perfect for anyone on a Low Carb Healthy Fat (LCHF) diet, but also for anyone that loves a full flavour sauce that is amazing with Skinnymixer’s Silky Sweet Potato Mash. A massive thank-you to Karla D’Lima (Lala’s Kitchen) for letting us feature this delicious Thermomix recipe whilst Nik is away doing research & development for an upcoming cookbook in Europe (lucky girl!!!). If you haven’t yet checked out Karla’s other recipes like the Chunky & Creamy Beef Curry , Chicken & Sweet Corn Soup or Calderetta (Filipino Beef Stew) then I strongly suggest you give them a go! Add some risoni into the pan when baking to soak up some of the delicious sauce. Add different vegetables into the tray to bake in the sauce… delicious with broccolini, cherry tomatoes, beans and “apparently” garlic fried mushrooms. Freeze leftover sauce in ice-cubes to make some delicious Creamy Lemon Butter LCHF Chicken Kievs. Add a cup of rice into the bottom of the dish with 1 cup extra liquid stock. I highly recommend that you guys give this recipe a go, it is so delicious and full of flavour. I love this dish and have been making it for over a year. I like to serve it with pearl cous cous because I just love the texture of it. This sauce is just completely drinkable too. Super delicious. Can’t believe I waited so long to try this! So delicious! could this be converted to slowcooker ? Absolutely. I saw this recipe originally as an oven baked dish. It’s been converted to thermomix. Definitely give the slow cooker a go!! Would this work with boneless/skinless chicken thighs? To die for! I add a cup of arborio rice to the bottom of the dish and a bit more liquid, and it is devine. A huge hit with everyone I’ve cooked it for. Just tried this and it was AMAZING! We will definitely have this again. A must try. I love the taste of this meal but can anyone tell me why it splits sometimes and not other times, also what I should do to avoid it happening in future. I am obviously doing something wrong and I thicken it with thickening granules. I do not want to add rice or anything beneath the chicken and sauce . Any advice would be much appreciated. Thanks. Hello 👋! 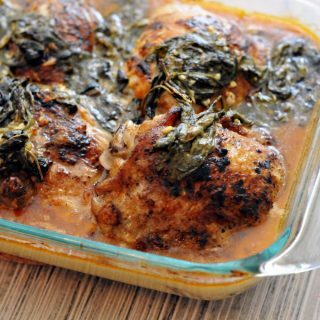 Just wondering if anyone has made this without the spinach it and have it still come up lovely ? Without the spinach wouldnt alter the taste much at all, it would still be delicious! I only have the thermo vegetable stock will that work ? I used veggie stock and it was delish! After Reading the comments I decided to add cherry tomato’s & risoni for an all In one meal & I wasn’t disappointed . I could drink the sauce, yum! When using salmon as alternative to chicken, how much by weight is equivalent? Had this tonight, and I used the Skinnymixers chicken stock. It was delicious and such a nice change from the typical cream and garlic that I would normally use in a dish like this. Everyone in the house thoroughly enjoyed it. Thank you! How my, this was absolutely scrumptious. I made this recipe for the first time tonight after seeing so many rave reviews and it definitely did not disappoint. I added 1 cup of jasmine rice and 1 cup extra chicken stock and replaced the double thick cream (didn’t have any) with coconut cream. ha ha “apparently” the mushrooms are good Sian? Which paprika is best please? You could put spring onions in instead? That’s what I’m going to use as I don’t have enough garlic and I don’t eat onion! OMG this is AMAZING!! I added two cups of rice an extra cup of stock and doubled the sauce. Used Chicken thighs (bone in) and drumsticks. Everyone loved it and we have leftovers! I loved that it was super quick and very little clean up. Amazing flavours! I wasn’t a fan of this first time around as it had a horrible raw garlic taste. This time around I cooked the garlic for three minutes, 100c speed 1 and it made a huge difference. Also added some quartered baby potatoes, sliced field mushrooms and broccolini. Was a great one pan dinner. This will be one of our regular dinners now. Has anyone tried it with chicken breast ? It’s all I ever use in it as I don’t like bones or any other cut. Holy moly! Delicious, quick, and ingredients that I don’t have to go and get. I will definitely make this again, and again, and again!